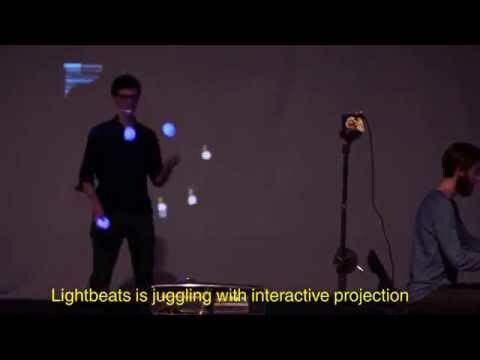 Lightbeats is juggling with interactive projection. Using webcam and notebook we can track the juggling balls with infrared led 75 frames per second. Project is developed in collaboration with UMPRUM, FAMU, Institute of intermedia and Gymnázium Jana Keplera high school as free to use for noncommercial usage under Creative commons license hosted by github. It is possible to tweak the visualization output to fit any theatre performance or art installation. Beside the video it is also possible to generate audio output or to control physical devices such as robotic arms, quad-copters or printer. Do not hesitate to contact us for further collaboration.